The law allows Minor League Baseball clubs to avoid paying players for overtime wages, requiring instead that they pay the minimum wage for a 40-hour work week during the baseball season. Players are typically required to arrive at the ballpark around 1 p.m for a 7 p.m. game, and are there at least a half hour after they leave the field, so you can see that they’re working more than eight hours on a typical day. It’s also unlikely that they’ll have a five-day workweek. And the one day off they might get is probably spent on a bus to the next city. But minor league baseball players all get big signing bonuses, right? But they’ll make the big bucks once they reach the Major Leagues, right? Sure, if they’re among the handful who do reach the Major Leagues and stick around. See, every organization has somewhere between five and nine minor league affiliates, ranging from the almost-but-not-quite Major League level Triple-A teams to developmental teams filled with Latin American teens. So figure that each organization has around 200 minor league players under contract, all hoping to win one of 25 Major League roster spots someday. Most of them won’t get there, and many who do will stay for less than one season. Major League Baseball is a $10 billion business, and they are the ones paying player salaries at the minor league level. Yet they spent $1.3 million to lobby politicians last year… and we see that it worked. It’s not clear which lawmakers got this measure included in the spending bill, but the Washington Post reported that Senate Majority Leader Mitch McConnell (R-Ky.) supported it and that Senate Minority Leader Charles E. Schumer (D-N.Y.), House Speaker Paul D. Ryan (R-Wis.) and House Minority Leader Nancy Pelosi (D-Calif.) were willing to “entertain” the measure. So “America’s Pastime” didn’t exactly need saving, at least at the Major League or the affiliated Minor League levels. The Minor League players did, and this act doesn’t help them at all. On the other hand, Baseball America reports that it will hurt most of the independent baseball leagues around the country. These leagues give players who weren’t drafted a second chance to play baseball. A handful will find their way into the affiliated Minor Leagues. Occasionally, somebody will come from independent league baseball and make it to the Major Leagues, but mostly when that happens it’s a guy who already had some Major League experience. See, most of the independent leagues don’t even pay their players the equivalent of minimum wage for a 40-hour work week. The Frontier League has a $75,000 salary cap per team , which is an average of $725 per player, per month. The American Association and Can-Am Leagues have similar salary caps, although their caps stretch into the low six figures. Leagues like the United States Professional Baseball League, Pacific Association and Pecos League have significantly lower salary limits. These teams don’t have Major League Baseball’s billions behind them… but I can’t think of a reason that they should continue to exist if they are only profitable because they exploit their players by paying sub-poverty level wages. The Trenton Thunder will hold their annual “Welcome North” open house event on Tuesday afternoon, April 5th. The event offers fans their first chance to meet the 2016 team before the Eastern League season opens on Thursday. The Thunder, the Double-A affiliate of the New York Yankees, will offer tours of the ballpark from 3-5 p.m. and there will be a player autograph session from approximately 5:30-6:30 p.m. The concession stands will be open, offering free hot dogs and sodas through the event. For additional information, visit the Trenton Thunder team website. It’s a slow week for baseball news, leading NJ.com to publish an article asking “what’s next” for the former home of the Camden Riversharks, Campbell’s Field. The short answer: not much, unless you are a fan of Rutgers-Camden baseball. So, what exactly do you think the Binghamton Mets have planned for their April 12th promotion? 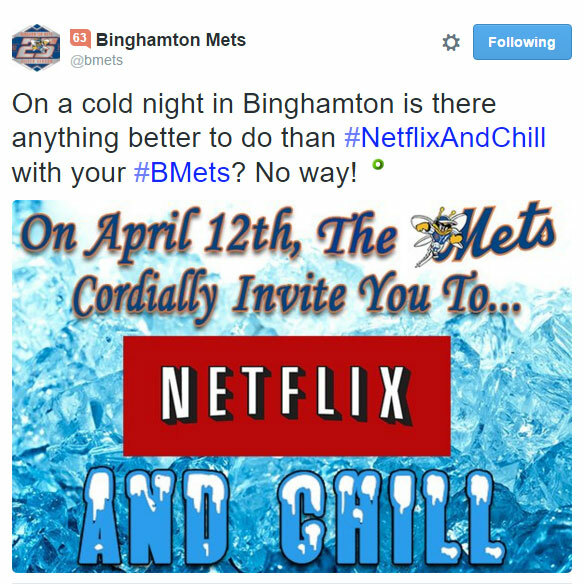 10:45 p.m. Update: The Binghamton Mets account deleted their original “Netflix and chill” tweet and posted this clarification. I’m cheating a bit this week to feature two baseball cards of New York Mets prospects. And I’m pretty sure I got my set of 2015 New York-Penn League Top Prospects at a Staten Island Yankees game I went to in September with my friend Greg. But let’s talk about our two Brooklyn Cyclones players. The Columbia (S.C.) Fireflies, the New York Mets new Single-A South Atlantic League affiliate, officially unveiled their uniforms for their inaugural season at a press conference yesterday.